Taking a page from Melia Rewards' playbook, WestJet Rewards has, for quite sometime now, been sending out emails with a Deposit & Fly offer to select WestJet Rewards members. If you haven't got one yet don't worry, WestJet hopes to get one to each WestJet Rewards member eventually but of course there are those who are more likely to get them first and perhaps more than once due to past booking history! 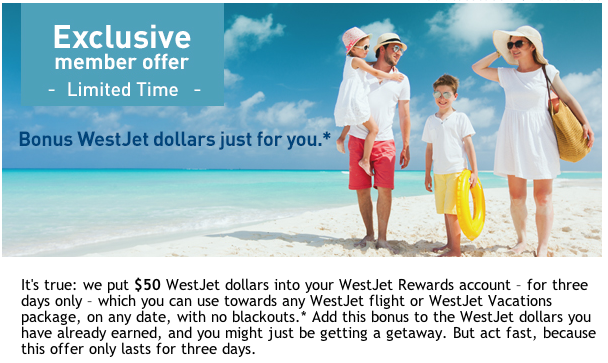 Even if you aren't a member yet you should join the WestJet Rewards program as you never know when this offer may come your way! What is Deposit & Fly? This is a great promotion for WestJet to get people to book sooner than later and try out the redemption process if they haven’t done so before. So here is our tip: Make sure you are a WestJet Rewards member, do not delete any emails from WestJet without reading them as you may miss out and don’t unsubscribe from receiving Rewards offers as you will never be targeted for offers like this or the current fast track to Elite Status offer!